GSMArena team, 09 February 2018. You can imagine we have a ton of phones lying around at the office. You'd think then it would be easy enough to pick up just the right one for any given task at any given time. Ah, but selfie videos? Has anybody looked into which phone is the best for vlogging? We are not quite sure, but we're sure we haven't. Well, about time we fix this. We ended 2017 with a few top ten lists where we tried to pick the 10 best phones in several categories: battery life, display quality, and camera performance. The latter we split further into three: rear camera stills, rear camera videos, and selfie stills. Plenty obvious what's been missing then, and we'll be addressing it now - front camera videos. There are probably more than a few ways to look at it. 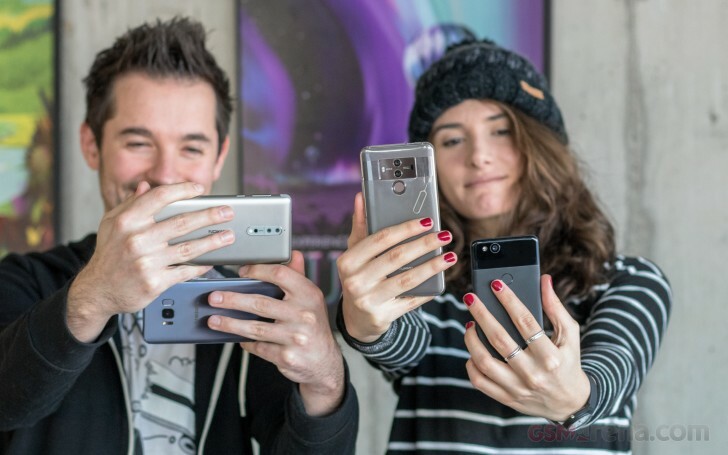 For an aspiring vlogger making their first steps in the field, a smartphone is the obvious device to test if the glamorous YouTube vlogger life is worth pursuing. That's a very specific use case, however, and one that comes with more or less strict peripheral hardware requirements - tripod/handle/gimbal, mic, lighting, the lot. All of which is extensively covered, precisely on YouTube. And it's not like vlogging is the sole use of the front-facing video camera. Moments must be recorded for personal use and not just for the world to see - perhaps even more so. Plus, around GSMArena we're not vlogging people, we're phones people. Hence, we're more inclined towards looking into what a smartphone is capable of all on its own - that is, for video capture of yourself with the screen as a viewfinder. We figured it wouldn't be much too complicated of a task until we actually got round to doing it. One by one, the list of criteria grew pretty long. If we only knew what we were getting into.